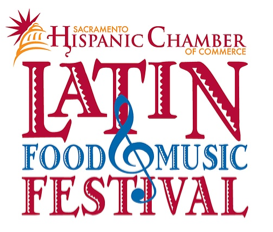 Sacramento, CA - The Sacramento Hispanic Chamber of Commerce will host the Latin Food and Music Festival to celebrate Hispanic Heritage Month on Saturday, Sept 27th 2014 beginning at 10 am and ending at 5 pm. The Festival is the month's largest all inclusive Latino event with a day of live music, cultural dance ensembles, Art Expo, and free children’s activities. Cesar Chavez Park will smell of delicious Latin cuisine, and teach how to stay healthy with the health area providing needed resources to the community. Cesar Chavez Park acts a new venue for the LFMF, and will showcase a full day of entertainment with the regions favorite dance troops and musical bands. Community members can arrive early, and be entertained the whole day by joining the Del Campo dance Studio community lessons. Applications are available on-line for Business/Nonprofit outreach booths, Food Vendors, and Arts and Education vendors. The Latin Food and Music Festival will feature the regions favorite dance troops and bands. The family centered event will offer engaging activities for children including the Free Children Activities. Children can engage in FREE art activities like creating Drums and Hand Held Maraca from recycled material including paper towel rolls and filling with dried rice. The activities engage the children to learn about music, making art with recycled objects, and having fun by creating it all by them self. Many free activities will be offered, and the SHCC is collecting recyclable material to ensure all activities are free. Items like toilet paper rolls, paper towels, cardboard cylinder containers, paints, glue, tissue paper, cotton balls and pipe cleaners are some of the items needed for donation. The Latin Food and Music Festival is a family event created to engage the community as a whole to celebrate Hispanic Heritage month. The one-day festival will have over 200 volunteers working together to ensure the event is safe and fun for the community. List of bands, food vendors and arts vendors are available for media appearances upon request. No glass or opened containers will be allowed in to LFMF. Attendees may bring chairs and blankets. For more information on sponsorships or vendor booths please visit www.sachcc.org/festival.